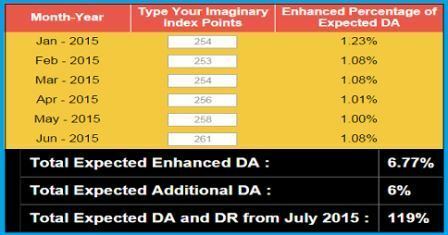 Expected DA from July 2015 – To wait for the month of June AICPIN data that will be released on July 31 to find out. What will the additional Dearness Allowance increase be from the month of July to Dec 2015? One has to wait for the AICPIN data for the month of June 2015 that will be released on July 31 to find out. Central Government employees are not the only ones who are eagerly waiting to find out what the DA percentage hike will be from July to December 2015. Central Pensioners and employees of the banking sectors too are curious to know. Additionally, the employees are working under state governments are also covered in this circle. It has almost been confirmed that there will be a 6% hike in DA this time. But, it will be absolutely confirmed once the June AICPIN statistics is revealed. The fluctuations of the June AICPIN is not expected to dramatically affect the fate of July’s DA hike, but it will have some impact on the DA hike that will be announced for January 2016. 3 Points increased and pegged at 261. As per the press release of Labour Bureau today, the All India Consumer Price Index (IW) is increased by three points from the existing level and stands at 261. ‘Expected DA from July 2015′ is finalized as hike by 6%.